Microsoft Data Insights Summit was very exciting for Power BI Mobile. During the Keynote presentation we announced the Power BI app for Apple Watch, and showed off our new augmented reality feature. During the Mobile-specific session, we answered your questions and gave a demo of some cool new features that are on the way. 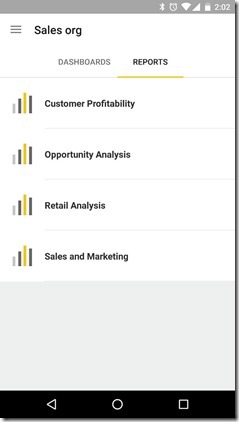 In case you missed the Mobile session, or want to view it again, here is the Power BI mobile session recording. Most of all, it was a real pleasure to meet you, our Power BI Mobile users, face to face and getting live feedback. Some of your suggestions are already integrated in this release! We are happy to announce a preview of the Power BI app for Android, with support for SQL Server 2016. 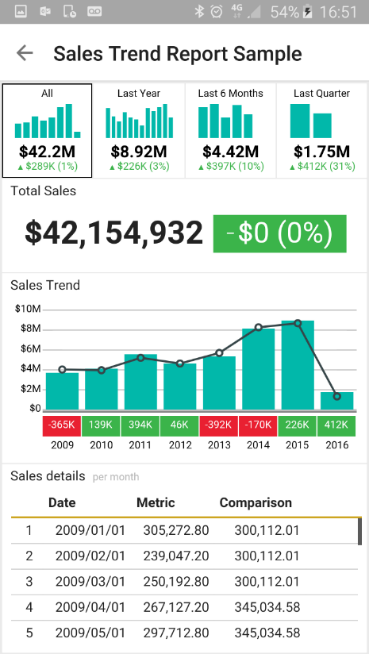 With this update you can seamlessly bring your on-premises data to your Android phone and stay on top of your business from anywhere with out-of-the-box mobile reports and KPI tracking. 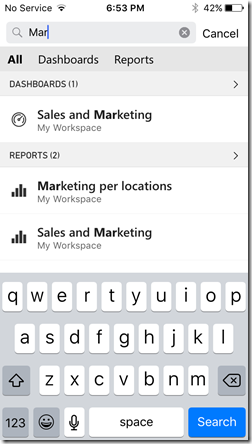 View your mobile reports and KPIs using SSRS folder navigation and access your data quickly by using the favorites section. 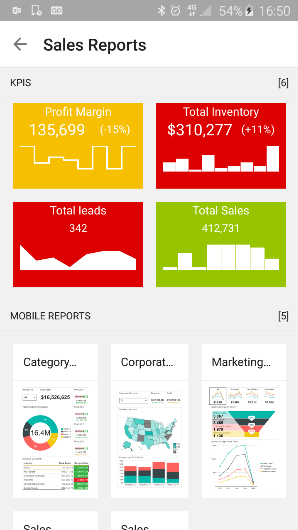 Whether you use SQL Server Reporting Services on-premises, Power BI in the cloud, or both, you can now use your Android app to access dashboards and mobile reports on the go. Get started with SQL Server 2016 on Android. One of the key features of the Windows 10 mobile platform are Live Tiles, which provide a live view of information from your Start screen. The Power BI app for Windows 10 already supports Live Tiles as a shortcut to dashboards, but with this update we're also adding the ability to display actual metrics on your Start screen. Pin any KPI, card tile, or multi-row card tile directly to your phone, tablet, or desktop Start screen, and in just a glance you'll be able to keep track of your most important indicators. 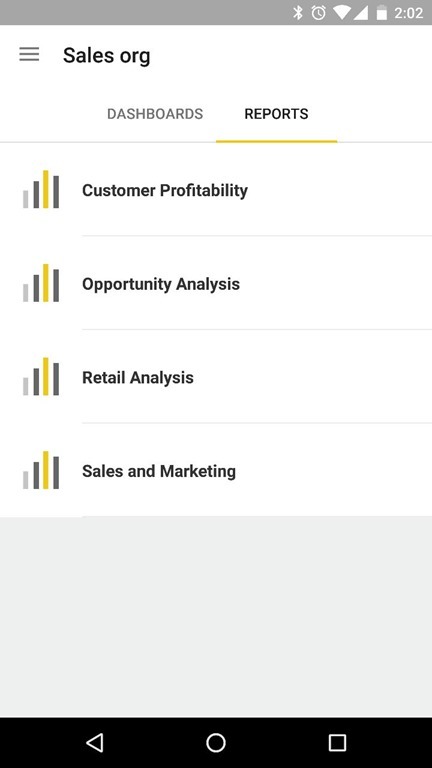 Following iOS we are happy to add the report gallery to the Power BI app for Android, allowing you to access your reports directly from the main menu. This new capability will give you easier access to all of your data, even if it is not is not featured on your dashboard. Simply open the menu, select your favorite report, and start exploring! Data can play a significant role during presentations, such as displaying Power BI dashboards and reports on a Surface Hub or any other large screen. With this update, you can use the new full screen mode to improve your presentation experience. Clicking on the full screen icon will expand the app across all of the available screen, and the navigation bar can be collapsed to reveal even more screen space. Full screen mode makes it easier for you and your viewers to focus on the presentation. Presentations often require a combination of data from different dashboards and reports. The new full screen mode will allow you to fully navigate within your workspace, working between a dashboard and the dashboard index, and navigating easily between different reports. 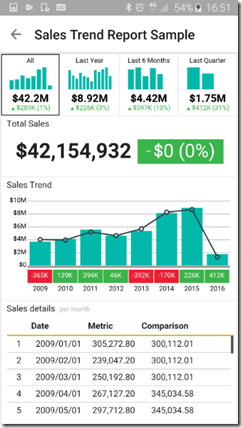 In the March release we introduced global filters and the recent menu on the Power BI Mobile app for Windows 10. We are now happy to bring these same capabilities to our iOS apps. The global search allows you to search for dashboards, reports, and groups by name. Simply begin entering your search terms into the input field, and results will instantly appear. Search results are separated by type, which means you can narrow your search by selecting a specific type of result on the search result ribbon. 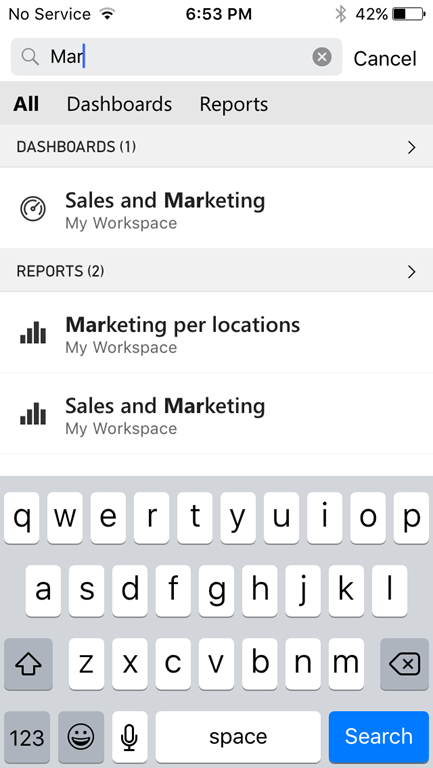 These two features make it even easier for you to find and access the data you need on your mobile device. That’s all for this update. We hope that you enjoy this new update and continue sending us valuable feedback about our product. Please don’t forget to vote for other features that you would like to see in the Power BI service in the future.